The glycerin method for making liquid soap is quite popular as the main benefit is how it greatly reduces the time it takes to make your soap paste. Glycerin in place of water speeds up the entire process which is very appealing to many soapmakers. Making liquid soap using distilled water as your liquid can be very time consuming especially when working with formulas high in olive oil. These formulations high in olive oil take a very long time to trace (up to an hour for me) causing overheating of stick blenders, arm fatigue and so on. 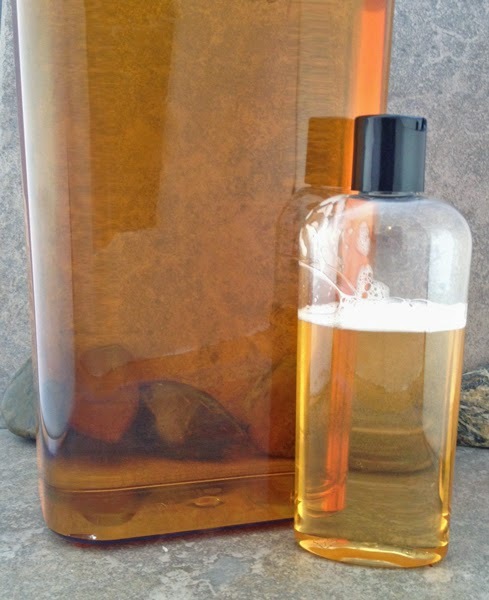 The first time I made a 100% olive oil liquid soap, I was quite surprised (and frustrated) with how long it took. Here is where using glycerin in place of water will be beneficial. My 100% olive oil liquid soap using all glycerin instead of water to dissolve my KOH takes 2 1/2 hours from start to finish (not including diluting the paste). This includes the time it took to measure out and prepare my ingredients and equipment. So, let's get started...................... Please read through everything first before attempting this. If you are unsure of the purity of your lye, you may want to use a lower superfat to insure that you do not end up with an unintended superfat that is too high for clarity. 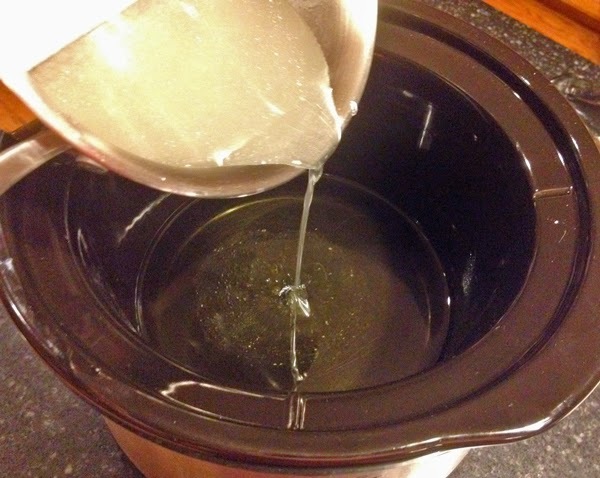 My 4.5 quart crock pot does a great job on formulations with 20 - 30 ounces of oils. Any more than that, and the mixture gets too close to the top of the pot. Step 1: Whenever creating soap from a new formula always calculate your water and potassium hydroxide amounts even when they are given. I use Brambleberry's or Summerbee Meadows Lye Calculators for liquid soap with a 0 - 3% superfat. If find theses calculator work well for my formulations and I do not superfat above 3% as excess fats that cannot be saponified may cloud your soap. I also do not formulate with a lye excess which would require an added step of neutralizing the excess lye afterwards. Even though I have already given the KOH amounts for this formula, I still recommend this process as these calculators have been updated and improved over time to account for the 10% impurity found in KOH. There a lots of older formulations out there on the web and in books that are formulated with a lye excess and the extra step of neutralization with borax, boric acid or citric acid. So always run the formula you are using through a calculator (or if you want, you can calculate by hand). Step 2: Measure out your olive oil into the crock pot to heat. Bring oils to a temperature of about 160 degrees F.
Step 3: Measure out your glycerin into the stainless steel pan. I use a 2 quart Stainless Steel saucepan for the amount of KOH/Glycerin for this formula. Make sure that it is stainless steel only. The Potassium Hydroxide will react with other metals or coatings. DO NOT HEAT YOUR GLYCERIN AT THIS POINT. Step 4: Measure out your Potassium Hydroxide into a suitable container. 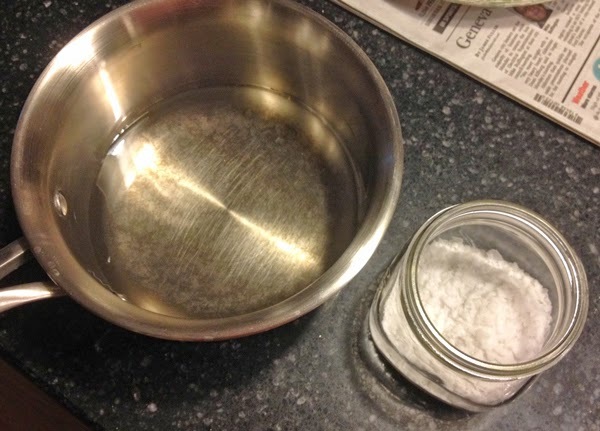 Step 5: Add your KOH to your ROOM TEMPERATURE glycerin and mix well with your stainless steel utensil. Step 6: Heat this mixture on low to dissolve the KOH. The temperature will get very, very hot (up to 300 degrees F) so be very careful. By heating the two together, you avoid the bubbling up that occurs when room temperature KOH is added to and reacts with hot glycerin. Continue to stir until all the KOH is dissolved. This can take upwards of about 10 minutes or so. 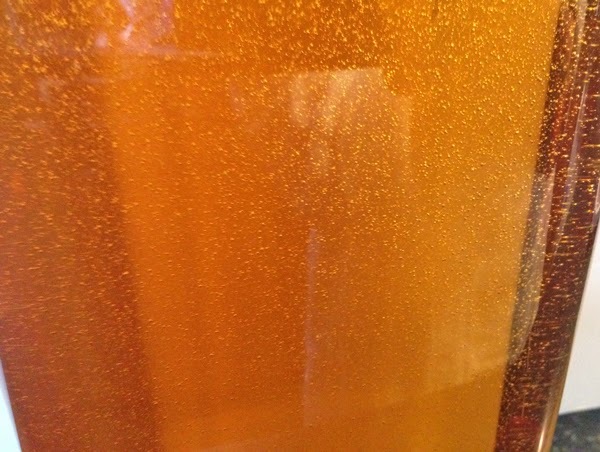 Your mixture may be completely clear or slightly amber in color and even slightly cloudy. I find you need glycerin in the amount of at least 3 times the weight of your KOH for it to dissolve completely. Make sure there are no bits or pieces of KOH floating before moving on. Step 7: Slowly add your glycerin/KOH mixture to your heated olive oil. 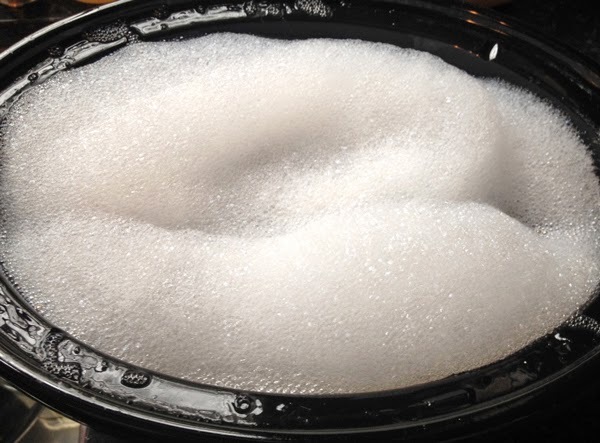 Because glycerin is a bit more viscous than water, you may have to scrape the sides of the pan to get it all in. Step 8: Use your stick blender to blend the ingredients into a homogenous state. 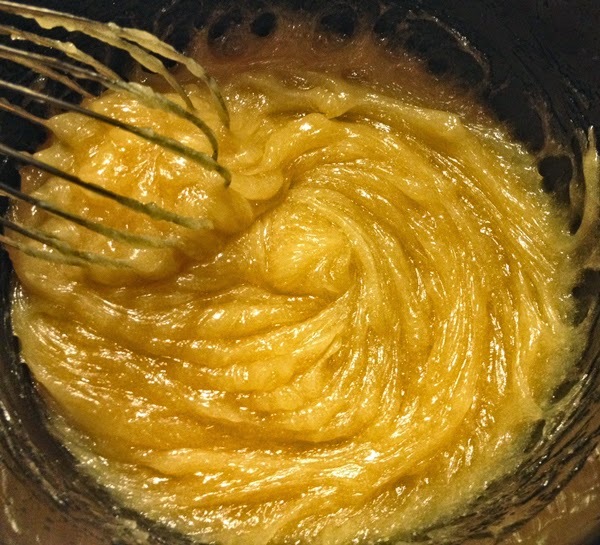 It will take about 10 minutes to go from the initial mixing to a thick, fluid and glossy paste. The only typical stage I see with this is the applesauce stage before going thick and matte, to thick and glossy. 100% Olive Oil paste will not get stiff and/or hard while hot. Apologies for the blurry pic of the applesauce stage. 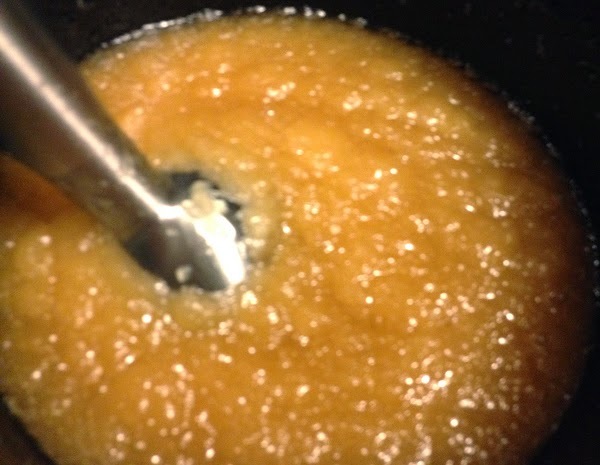 In about 10 minutes your paste will go from light opaque bubbly, to slightly homogenized, thin applesauce, thick applesauce, thick smooth matte to thick smooth glossy. Do not look for mashed potatoes texture or stiff taffy. 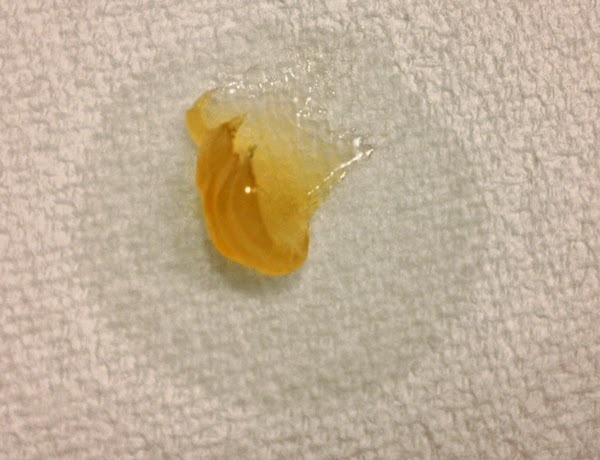 Now if you read my other tutorial on glycerin liquid soap making you will remember the notes about tiny bubbles flying up from your paste as an indicator of when to stop stick blending - this does not happen with 100% olive oil paste. Step 9: Once your paste has achieved that glossy, translucent appearance it is time to cook it. Normally liquid soap paste can take 3 - 9 hours or so to cook to make sure all your fats are fully saponified. Using the glycerin method greatly cuts down on that. 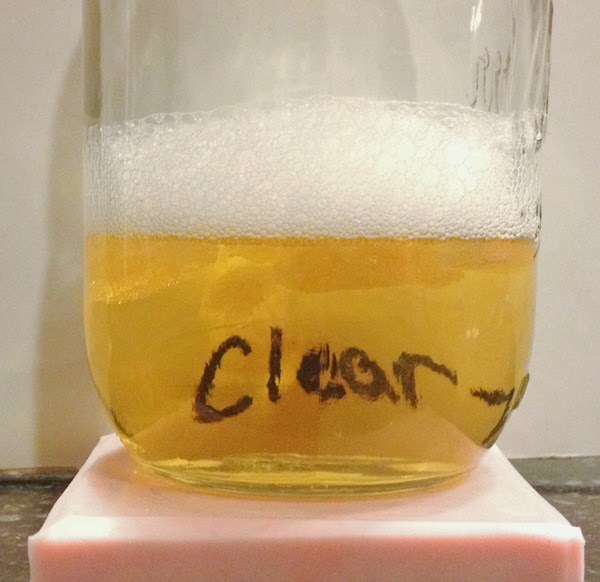 Soaps will test clear usually within 30 - 90 minutes from this point. My first Phenolphthalein drop test is dark pink. Cook on high. Step 10: Check your paste and stir every 30 minutes. Test with Phenolphthalein drops by taking a tiny amount of paste and placing it on a white paper towel or paper plate. Apply a drop or two of the Phenolphthalein Drops to the paste and watch for a color change. Your paste is done (no excess lye) when the test is clear or very light pink. If using a paper towel, you may find a pink ring around your paste area after 5 minutes or so too - this is fine too as long as the actual paste is clear or a very, very pale pink color. Once the Phenolphthalein tests clear, test for clarity by diluting about an ounce of paste in 2 - 3 ounces of boiled distilled water (Olive oil liquid soap needs quite a bit of water to dilute) for clarity. Your soap should be quite clear. This is how fluid your paste will be while still hot. It will not get stiff. Step 11: Your paste is done. You can turn off the crock pot and let the paste sit overnight or you can keep it on warm if you are one who likes a long cook. 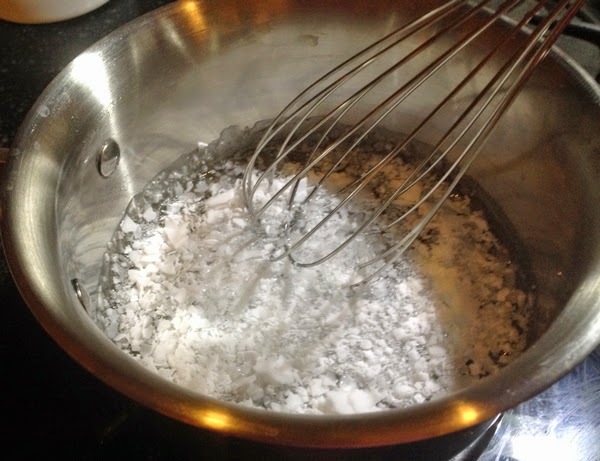 Some formulas benefit from a long cook time as it seems to nudge the pH of the soap down a bit. I think keeping the hot paste in the crock pot to cool down slowly is sufficient. 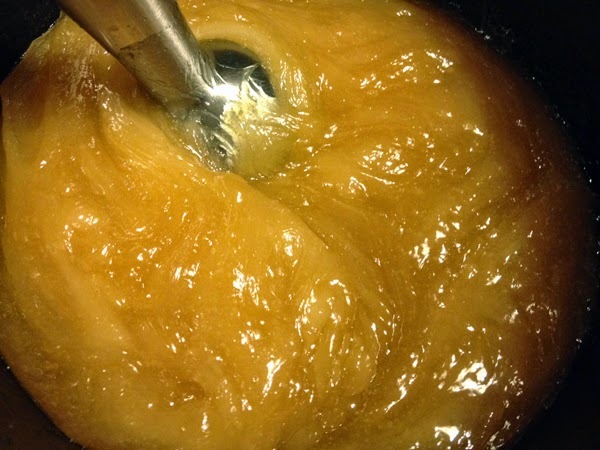 It is now about 11:00 pm - 2.5 hours from start to finish for the creation of the paste. Now it can just cool down overnight or leave on warm overnight if you prefer. As your paste cools it will harden. This is my paste the next morning. Definitely not fluid as when hot but still not hard. It is malleable. Step 12: You are now ready to dilute your paste. Olive oil paste requires quite a bit of water to fully dilute. Some people use a ratio of 1:4 or even up to 1:6 for olive oil paste. I am going to start at 1:1.5 and go from there adding water as needed until the paste is fully diluted. Again, I find using the glycerin method usually requires a bit less water to dilute. 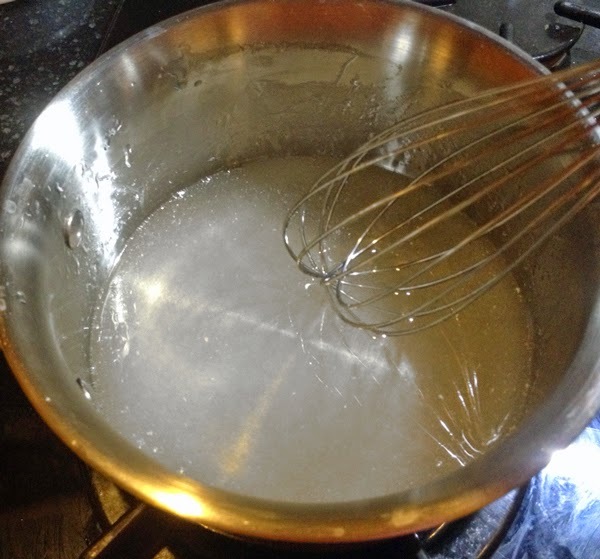 Remember when diluting any paste, you need to keep in mind the concentration of soap you wish to achieve (this is often referred to as "% neat soap" and the viscosity. The less water, the more concentrated your soap is and may be overkill for your intended purposes. It may be thicker than a more diluted soap but you will go through it much faster - especially when a lower concentration of soap is sufficient for your purposes. Some people place viscosity over concentration and end up wasting a lot of soap paste - there is a fine balance based on one's needs in a liquid soap. 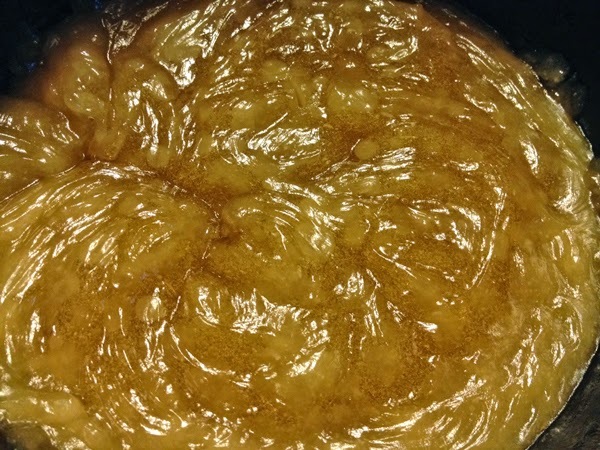 Now, I did not remember to weigh my paste before I started dilution but, the finished soap with this formula came out to about 115 ounces of diluted soap with a medium viscosity. Not water thin, but not a gel. I actually still have a few small chunks of paste floating in the soap and if it is still there by the end of the day, I will add another ounce of boiled distilled water to complete the dilution. I have added about 95 ounces of distilled water to my paste. Based on the amount of oils, glycerin, KOH and dilution water and evaporation, this looks to be about a 1:2.3 dilution ratio of paste to distilled water. NOTE: I moved my paste into a larger 6 quart crock pot because I knew that the 4.5 would not hold it all since I was going to need quite a bit of dilution water. You can kind of tell the viscosity from the suspended bubbles that appear as I pour the diluted soap into a container. These bubbles will slowly rise to the top and dissipate within the an hour or so. 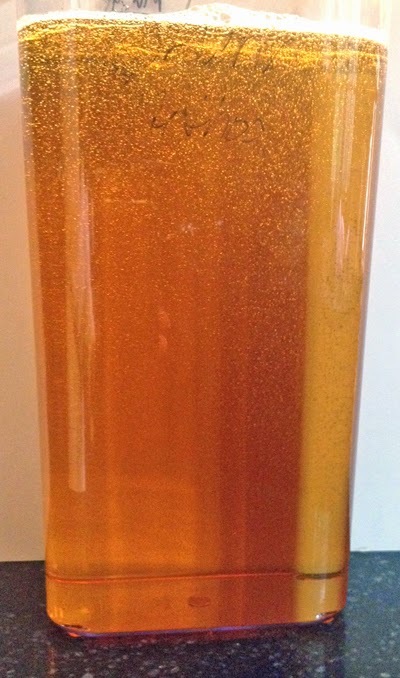 The thicker the viscosity, the longer until the bubbles dissipate. The pH of this soap is about 9.3 - 9.5 which is completely normal for liquid soap created from KOH. 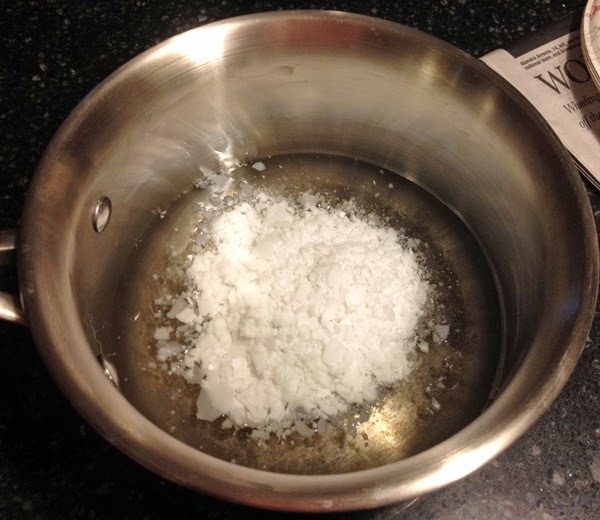 If you prefer a lower pH, you can always adjust it with the use of a citric acid solution or a borax solution (borax will only buffer your soap to a pH of about 9.2). As usual, you have to be careful with using these buffers/pH adjusters as adding too much of either one will create problems in your soap (cloudiness, separation, etc.). I prefer to let the soap sequester for a few weeks to see where the final pH will land. Another thing you will notice is the color of the soap. Soap made with a high amount of glycerin does tend to be darker in color than soap made with distilled water. Finished Soap after sitting for about an hour to let the trapped air bubbles rise to the top. Does the soap lather well? Here is an image of the crock pot filled with hot water for clean-up. Copyright 2006 - 2015 Alaiyna B. Designs/Alaiyna B. Bath and Body. All rights reserved. All text and images are the property of Alaiyna B. Designs/Alaiyna B. Bath and Body. No part of this document or webpage may be reproduced by any means without prior written consent. That looks like my next batch! Thanks! This is a wonderful liquid castile soap recipe. I loved it so much I made another batch right after the first one! This was possible because of the gycerin speeding up the cooking time. I used a different olive oil in the second batch and it processed in 40 minutes. Wow! Thank you for sharing your recipes so generously. I appreciate the amount of work that goes into all of it. Thank u so much for sharing ur wonderful recipe! What is the shelf life for this soap? Many say I have to use a preservative, do i really have to?? thank you for this post! i was worried when my cooked paste looked fluid and unlike those using the water method, and i thought i didn't stick-blend it enough! now i know that i did correctly. thank u again! I am just finishing up my first batch of castile. I LOVE your recipes and tutorials. So far this one and the beginner recipe are just fantastic. I have been telling everyone to check out your blog. Thank you! Thank you for those dilution ratios!!!! I have a recipe that I follow but it doesn't give many tips to diluting the soap paste. Really appreciate that! Did you just buy any pH strips or do you use a certain brand? Do you use an antioxidant? I'm still unsure as to how I calculate that into my soap recipe. Any guidance is appreciated.